I’m running Maverick Xubuntu on my Desktop Box and finding that if I burn m4v files created in Handbrake of about 1.4Gb using DeVeDe that the resulting iso image is 80Mb yes Meg. When I play them in VLC they are either chopped short or run too fast and short. If I convert them from m4v to avi then DeVeDe creates the correct sized working iso. It’s a solution but who wants to convert files twice when DeVeDe should just do it. All worked ok just a couple of weeks ago [March 2011]. I’ve tried reverting to previous versions of both handbrake and DeVeDe with no luck and am beginning to think it may be an ffmpeg problem. If I run DeVeDe from the command line I get the following output in the Terminal.. So apart from a missing mplayer socket problem, a deprecated python reference it’s skipping lots of frames no wonder the results are poor. 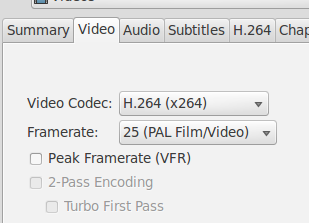 I think I’ve now solved this after days of testing, the solution seems to be to not convert m4v’s in handbrake using the Framerate option [Same as Source]. So in the Video Tab you need to select an actual frame rate for the conversion. I’ve tested this with two different clips from DVD’s and this has now let DeVeDe create a correctly sized iso image which plays perfectly in VLC. I hope this helps out others with the same problem. Why not consider donating some of your spare CPU cycles to the Folding@Home Project, Their goal is to understand protein folding, misfolding, and related diseases and we can help by doing the calculations they need doing using our spare CPU cycles. You can join teams and are allocated points for the work units you fold to give you an incentive other than help out the search for cures for various diseases. I started Folding at the beginning of 2010 for Team Ubuntu [id:45104]as a New Years Resolution hoping to get into the top 1000 Team Ubuntu user listing by the end of the year and have managed to get to 241 today having completed 420 Work Units gaining 143103 Points. Why not join the Team see the Recruiting notice here and help a good cause, my New Years Resolution for 2011?, to double my points, and as always loose weight, become rich and retire. Post post to your WordPress blog from Tomboy. In Tomboy Notes, go to [Edit], [Preferences], [Add-ins], expand [Tools] click on “Post note to your blog” click on [Preferences] click on [Add] and fill in details of your WordPress blog, the URL should be in the form http://your_blog_name.wordpress.com/wp-app.php/posts You can now open upload a note as a blog post by clicking on the [Tools] option (cog wheels) and selecting the [Post note to your blog] option. Floola was the application which finally allowed me to say goodbye to Windows/iTunes and go completely over to Ubuntu. I have an 80GM black 6th generation video classic iPod which I can now manage with Floola. I can sync music, audiobooks, photos, podcasts & my gmail calendar. It can cope with Apple formats but I now use mp3 for music & audiobooks. You can also add Album Art and if your mp3 already have Art it usually adds it automatically. and re-saved it to the iPod. 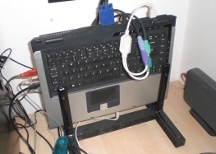 This allows it to be identified by Linux programs. Download and extract Floola from the website http://www.floola.com/ to a suitable folder on your HD. then type getlibs in a Terminal to install 32 bit libs on a 64 bit system. The Floola site has further FAQ and installation instructions and I’ve had the program working on both Ubuntu Lucid and Start-up sound fix for Maverick with no problems.